TRIVIA of Noh : Q43 : Is there any influence of “Shomyo” upon Noh chanting? | Home | Trivia | Q43 : Is there any influence of “Shōmyō” upon Noh chanting? Is there any influence of “Shōmyō” upon Noh chanting? 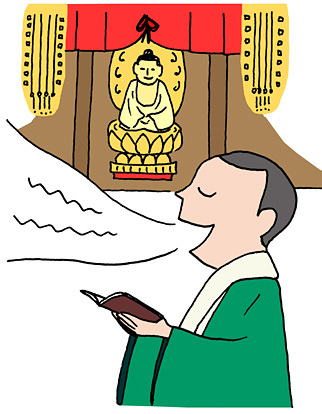 Shōmyō is the holy invocation chanted by Buddhist priests in services. Buddhism was introduced into Japan in the Asuka Period (6th Century). It is believed that Shōmyō had a great influence on the music and the art in Japan since then. Some studies indicate that Noh chanting retains traces of the influence of Shōmyō. While priests appear and read a sutra in some Noh plays, they never chant the holy invocation. However, several Noh terms are considered to originate in Shōmyō. For example, shidai is a type of music played at the entrance of supporting actors, and rongi is a part in which actors and reciters perform alternately, and they came from shidai-wo-toru (to act in order) and rongi (to exchange dogmatic questions and answers) respectively. The family relation between Shōmyō and Noh is indicated on the basis of such facts. People are attracted unconsciously by a vocal solo or unison without an accompaniment, which has a natural deep timbre. Both Noh chanting and Shōmyō have a power of musical voice to let us become disconnected with reality.